From an ISIS forum: a call to assist “our oppressed brethren in Muslim Lebanon” (https://www.alplatformmedia.com, December 2, 2014). Flyer issued by the Gaza District of the Islamic State regarding the obligation of women to behave modestly (Al-Mowaten, November 30, 2014). In Syria and Iraq, the US-led campaign against ISIS continues. In the city of Kobani (Ayn al-Arab) in northern Syria, the fighting continues with no decisive victory by either party. In the area of Deir al-Zor in eastern Syria, ISIS attempted to take over the Syrian military airfield, so far unsuccessfully. In Iraq, ISIS’s efforts to cleanse the pockets of resistance in the Sunni province of Al-Anbar and other areas in the north continue. ISIS released a video of a Canadian operative calling for more attacks in Canada. As may be recalled, in October 2014 there were vehicular attacks and shootings against military personnel and civilians in Quebec and Ottawa (the parliament building), apparently in response to the calls by ISIS to harm Western civilians. Al-Qaeda in the Arabian Peninsula (AQAP) claimed responsibility for attacks against the US Embassy and an explosion near the home of the Iranian ambassador in Sana’a, Yemen. An American attempt to rescue Western hostages in Yemen failed and ended with two hostages being killed. Syria– the attacks focused mainly on the Kurdish city of Kobani (Ayn al-Arab), where ISIS operatives have been fighting against the Kurdish militias (YPG) for around three months. There were also attacks in Aleppo and other battle centers in northern and eastern Syria. ISIS’s combat posts, staging areas and positions were damaged in the attacks in Kobani. A number of the organization’s operatives were killed and wounded. Iraq– the attacks focused on the areas of Mosul, Kirkuk, Sinjar, Baiji, Fallujah and Rutba. Vehicles, positions, buildings and other targets were destroyed in the attacks. In addition, several dozen ISIS operatives were killed. We do not know of any prominent operatives who were killed in these attacks. The White House spokesman said on December 1, 2014, that the US and Turkey have reduced the dispute between them with regard to US operations in Syria. He added that Turkey would allow the United States and other members of the coalition to use Turkish air bases to act against ISIS in northern Syria (White House website, December 1, 2014). In Aleppo, clashes between the Kurds and ISIS operatives have been going on for around three months. 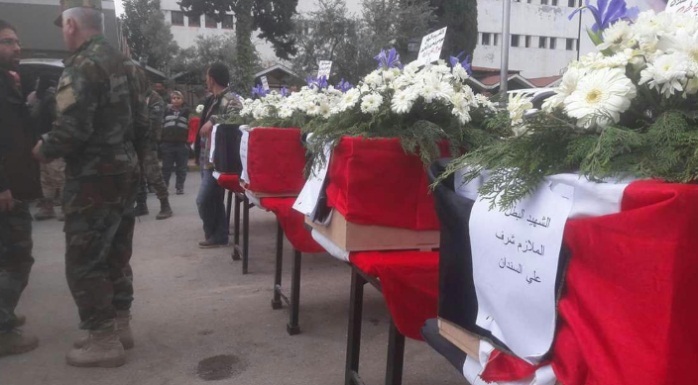 It was reported that ten ISIS operatives were killed on November 29, 2014, in clashes with the Kurdish militias (YPG). In addition, a double suicide bombing attack was carried out by ISIS operatives in Kobani (a car bomb and a suicide bomber). As a result of the suicide bombing attack, thirty people were killed. According to Kurdish sources, the suicide bombers came from Turkish territory. Turkey was quick to deny this. According to a Kurdish source, Kurdish militias control over 60% of the area of the city of Kobani (Al-Arabi al-Jadeed, December 7, 2014). The Kobani clashes: Left: ISIS operatives near the city of Kobani. Right: an explosion in the city as a result of a suicide bombing attack (Dabiq, Issue 5, November 2014). ISIS’s preventive security apparatus is trying to make it harder to collect the intelligence needed for the American campaign. 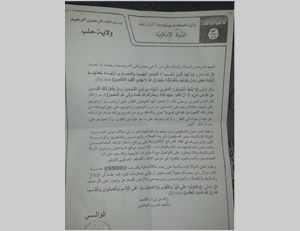 On November 23, 2014, ISIS operatives in the Aleppo area distributed flyers stating that the organization is offering a prize of USD 5,000 to anyone who aids in surrendering “agents of the crusaders” (i.e., those who help the coalition forces). The flyer also appeared on the organization’s Twitter page and forums (www.vocativ.com, November 24, 2014). ISIS has attempted to take over the Syrian military airfield of Deir al-Zor aspart of its effort to cleanse eastern Syria, most of which is under its control. At this point, the battles in the area still continue. According to media reports, ISIS operatives were able to take control of the southern part of the airfield (Al-Darar al-Shamia, December 6, 2014). On December 8, 2014, it was reported that the Syrian Army had managed to regain control of the airfield (Al-Safir, December 8, 2014). ISIS operatives posted a video which was distributed on social networks, claiming that for the first time, operatives managed to shoot down a coalition force aircraft on December 4, 2014, over the area of Deir al-Zor. The video showed wreckage of an aircraft in a field. It is impossible to tell whether this is a plane that was shot down or the remains of a Scud missile (Al-Quds al-Arabi, December 5, 2014). Official US government officials said that rather than rebuild the Iraqi Army units that were disbanded, the US intends to rebuild a lean, high quality military force. The force will numbernine new brigades, which will include 45,000 soldiers. These units will serve as a “vanguard force” against ISIS and will fight alongside Shiite militias and Kurdish forces. They said the force would carry out the necessary initial advance in the ground battle against ISIS (The Washington Post, November 27, 2014). Iran continues to assist the Iraqi Army and Shiite militias in their war against ISIS. After several denials from Iran,Rahim Pour, Iranian Deputy Foreign Minister for Asia and Oceania, confirmed that Iran has carried out air strikes against ISIS targets in Iraq. According to him, the attacks were carried out in response to a request by the Iraqi government and without coordination with the US (The Guardian, December 5, 2014). A social media report said that ISIS operatives managed to manufacture a “dirty bomb” (a bomb to which nuclear waste or radioactive materials is added) after they stole around forty kg of uranium from one of the universities in Iraq. The reports about the bomb came around four months after the University of Mosul published a report on the loss of uranium (Elaph, November 30, 2014). Following the abduction, the Twitter account of the Al-Nusra Front (Al-Qaeda’s branch in Syria) posted a notice stating that the organization had executed a kidnapped Lebanese soldier by the name of Ali al-Bazzal. The notice said that he was executed because the Lebanese Army had begun to arrest women and children. The notice also included a threat that if the Lebanese Army does not release the two female detainees, another soldier would soon be executed. 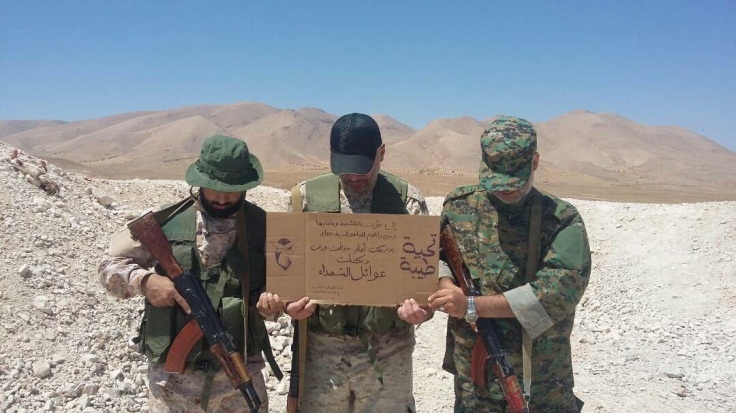 Sheikh Mustafa al-Hujairi, a Sunni notable of the town of Arsal (where there are supporters of global jihad organizations), acts as an intermediary in negotiations between Lebanon and global jihad organizations over the release of the detainees. The Sheikh criticized the action of the Lebanese government. He said the abduction of the women did not make the negotiations easier and caused the execution of one of the kidnapped Lebanese (Al-Anbaa, December 7, 2014). It should be noted that an arrest warrant was issued against Sheikh al-Hujairi in October 2014 by a Lebanese judge on grounds of his belonging to an armed terrorist organization (the Al-Nusra Front) and carrying out terrorist activities (Tayyar, October 14, 2014). 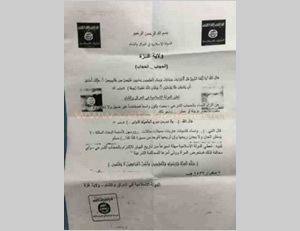 On November 30, 2014, flyers issued by the Gaza District of the Islamic State were distributed among the students at several universities in the central Gaza Strip. The flyers, which bore the ISIS insignia, called on female students to wear a head covering (hijab) and act modestly. They also included a call on poets and writers from the Gaza Strip to be careful in their language and avoid words and acts of heresy against Islam. Following the publication of the flyers, Palestinian Interior Ministry spokesman Iyad al-Bazm issued a statement saying that these flyers are no more than “craziness of young people with a particular ideology.” He claimed that ISIS has no presence in the Gaza Strip and that the security services are closely monitoring any problem (Dunya al-Watan, November 30, 2014; Al-Fajr, December 1, 2014). 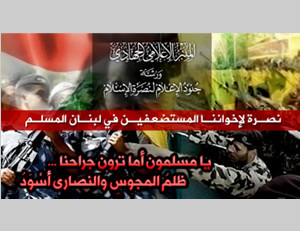 There are Salafist-jihadi organizations operating in the Gaza Strip that have been influenced by achievements of ISIS in Syria and Iraq, and are affiliated with the organization. Hamas sees their activity as a potential risk to its rule; it limits their operational and propaganda activities and attempts to monitor them. Egyptian sources claimed that Egypt’s security and intelligence apparatus have located two training camps affiliated with ISIS: one in Libya near the border with Egypt and the other in the Gaza Strip. These camps train operatives before sending them to Egypt to carry out terrorist activities against the Egyptian regime. In the camp located in Libya, there are operatives who came to Libya from Egypt, and others with foreign citizenship. 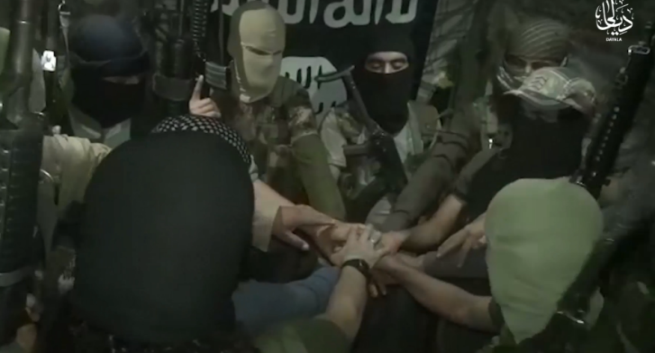 There are also ISIS operatives at these training camps engaged in disseminating the organization’s ideology among the trainees at the camp (Masrawy, November 25, 2014). ISIS has supporters in the eastern part of Libya. Their center is located in the city of Derna, where a local jihadi organization by the name of Majles Shura Shabab al-Islam announced that it was joining the Islamic Caliphate headed by Abu Bakr al-Baghdadi. 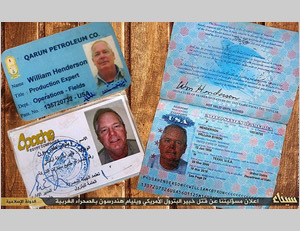 Ansar Bayt al-Maqdis(i.e., the Supporters of Jerusalem), a jihadi terrorist organization that recently announced it was joining the Islamic State, claimed responsibility for the death on November 30, 2014, of William Henderson, an American from Texas who worked in the oil industry in Egypt. Photocopies of his passport and work permit were uploaded on ISIS forums. A statement released by Apache Corp., where Henderson had worked, said that he was killed on August 6, 2014, and that the circumstances of his death are being investigated by the US government. The US government's response was not available (NBC News, December 1, 2014). Other reports indicated that he was murdered during the course of a criminal incident (car theft) in the Western Desert and not in the Sinai Peninsula (The New York Times, December 1, 2014). The Arab media reported that a jihadi operative known as Abu Usama al-Masri, who serves as the Mufti of Ansar Bayt al-Maqdis, came to Syria via Turkey in June 2014 with false Syrian papers. He reached Al-Raqqa (the ISIS “capital city”) and stayed there for around two months. During his stay in Al-Raqqa, al-Masri met with senior ISIS commander known as Abu Ali al-Anbari. They set the date for the announcement of his organization’s official pledge of allegiance to ISIS. An additional purpose of the visit was to coordinate the provision of financial assistance and arms to the organization via Libya. It was reported that many Ansar Bayt al-Maqdis operatives are in Syria and are fighting alongside ISIS (Al-Watan, December 8, 2014). On November 10, 2014, Ansar Bayt al-Maqdis announced that it had pledged its allegiance to ISIS Commander Abu Bakr al-Baghdadi and was joining the Islamic State which he heads. Thus the organization became the Sinai District of the Islamic state. Abdallah al-Anbari, AKAAbu Ali al-Anbari, who, according to the reports, met with an Ansar Bayt al-Maqdis operative, is known to the ITIC as a senior operative in ISIS who serves as the deputy of Abu Bakr al-Baghdadi for Syrian affairs and formerly served as an intelligence officer in the Iraqi Army. ISIS recently announced that, as an additional step towards the establishment of the Islamic Caliphate, it has minted new coins of gold, silver and copper. According to ISIS, the coins are intended to prevent corruption among members of the Islamic nation through the use of the currencies of the global economic system (Dabiq, Issue 5, November 2014). In this context, it was reported that ISIS operatives visited markets, schools and shops in the city of Kirkuk and the surrounding villages under its control, and asked residents to donate gold and silver for the production of the organization’s new coins (Al-Islam al-Youm, December 8, 2014). In November 2014, ISIS published the fifth issue of Dabiq, its English-language organ. 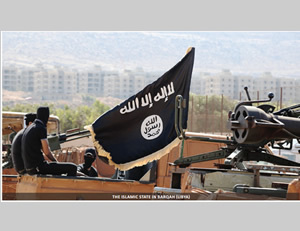 The issue, entitled Remaining and Expanding, reported on the spread of ISIS to new areas such as Yemen, Saudi Arabia, Sinai, Libya, and Algeria. The cover has a picture of the Ka‘aba in Mecca, with emphasis on the claim that the organization has gained a foothold in Saudi Arabia. The issue contains a number of articles, and includes the following sentence in its foreword: “The shade of this blessed flag will expand until it covers all eastern and western extents of the Earth.” The chapter dealing with the Sinai Peninsula states, among other things, that “Sinai is also a front against the Jews, an important step towards the liberation of Baytul-Maqdis [i.e., Jerusalem]” (Dabiq, Issue 5, page 29). On November 28, 2014, the French newspaper Le Monde published an investigative report about the change in ISIS’s patterns of behavior on the internet. The change was manifested in taking new precautions and security measures designed to prevent operatives from uploading whatever they want. The new instructions are strictly enforced. Among other things, it was noted that the organization has adopted means of encryption and the use of the TOR system (a free software network that allows anonymous surfing on the internet) to prevent identifying the sources of publications that operatives upload (Le Monde, November 28, 2014). ISIS released a video that was disseminated on Twitter, showing a young Canadian from Ottawa calling on his Muslim friends in Canada to carry out “lone wolf” terrorist attacks against Canadian targets. The young man, John Maguire, 23, is under investigation by the local authorities after traveling to Syria to join ISIS in January 2013. 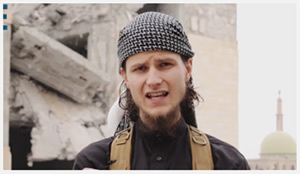 In the video he identified himself as Abu Anwar the Canadian and spoke in English. He called on his friends to carry out a terrorist attack similar to the one carried out in Ottawa in October 2014. It is unclear whether the statement was given voluntarily or whether he was forced to do so (CBS News, December 7, 2014). On October 20, 2014, a Canadian soldier was run over and killed in Quebec and another soldier was wounded. The driver directed his car at the two soldiers. He was killed by police after a chase. The perpetrator was Martin Couture-Rouleau, 25, who converted to Islam about a year ago. He was on the list of 90 extremist Muslims monitored by Canadian security services, with the aim of preventing them from traveling to Syria. The Canadian media reported that his Facebook page contained an ISIS flag and statements expressing solidarity with ISIS. The Canadian Prime Minister described him as a terrorist inspired by ISIS. On October 22, 2014, a Canadian soldier standing watch at the Canadian National War Memorial near the Parliament building in Ottawa was shot and killed. The shooter then entered the Parliament building, fired dozens of bullets and was killed by the Commons Sergeant at Arms (who displayed resourcefulness and became a national hero). The shooter was identified as Michael Zehaf-Bibeau, a convert to Islam. A group calling itself the Central Islamic Committee of Switzerland produced a video calling for an Islamic revolution in Switzerland. The video, which is in English, was produced under the name “Expect us Anywhere, Anytime!” The photography is high quality (reminiscent of the ISIS video from last month showing the beheading of 17 Syrian Army soldiers in Syria). The video shows, among other things, Muslim masses emerging from a forest, and states that this is the beginning of the Islamic revolution that changed the world. The video caused a great public outcry in Switzerland, currently home to around 400,000 Muslims, constituting approximately 5% of the country’s population (YouTube). On November 28, 2014, the night of Thanksgiving, a Twitter account belonging to Al-Qaeda in the Arabian Peninsula (AQAP) claimed responsibility for a terrorist attack against the US Embassy in Sana’a, the capital of Yemen, on November 27, 2014. According to the announcement, the attack was carried out by means of two IEDs placed at the entrance to the embassy (Nation.com, November 28, 2014). The US government has not confirmed the attempted attack. This is not the first time that Al-Qaeda has attempted to damage the US Embassy in the capital of Yemen. In September 2014, terrorists fired rockets at the embassy, which landed about a hundred meters away from it. On December 3, 2014, a driver drove a car loaded with explosives towards the Iranian ambassador’s residence in the embassy district of Sana’a, the capital of Yemen. The explosion killed three people. The incident, which occurred a week after the ambassador presented his credentials to the Yemeni authorities, gives rise to the suspicion that the organization was waiting for his arrival in the capital of Yemen (The Guardian, December 3, 2014). In a posting on a Twitter page associated with AQAP, the organization claimed responsibility for the explosion.According to the posting, the organization’s operatives parked a car loaded with explosives outside the ambassador's residence and detonated it. Contrary to reports that the explosion killed a guard and two passersby, the organization claims that it killed several Iranians who worked at the embassy. 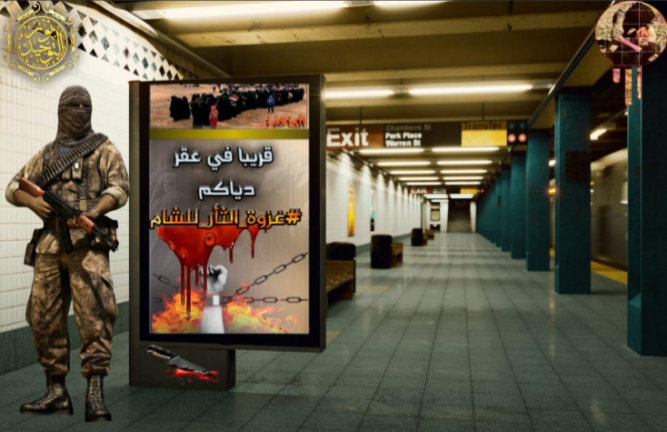 In a new video released by the media wing of AQAP, the organization threatened to kill an American hostage, photojournalist Luke Somers, if the US government does not give in to its demands. The video shows Nasser Ibn Ali al-Anasi, a senior Al-Qaeda operative, who described what he called the “crimes” of the US against the Muslim world. Then it shows a clip with Somers speaking. Somers was captured by Al-Qaeda about a year ago. An attempt by US Special Forces to rescue him on the night of November 24-25, 2014, failed. On December 6, 2014, shortly after midnight, US Special Forces (Navy Seals) were dropped from two helicopters a few kilometers from the building where Luke Somers and a South African hostage (Pierre Corky) were held. The operation took place in the Shabwah province in southern Yemen. According to a Pentagon source, the forces lost the element of surprise when they were apparently discovered when a dog barked. A shootout ensued between the terrorists and American soldiers. Immediately after the forces entered the building, the two hostages were shot by their captors. They were rescued and subsequently died of their wounds. Five terrorists were killed in the shootout and many terrorists managed to escape. The failed rescue operation was criticized by South Africa and the US. In a joint intelligence operation by the US and Turkey, senior Al-Qaeda operative Abd al-Baset Azzouz was detained in the city of Yalova, Turkey (south of the Marmara Sea). Abd al-Baset Azzouz entered Turkey with a forged passport. It was reported that he was the head of the Al-Qaeda squad that assassinated the US Ambassador to Libya (Milliyet, December 4, 2014). In 2011, Azzouz was sent to Libya by Al-Qaeda leader Ayman al-Zawahiri, where he assembled about 300 operatives under his command. He ran a training camp in Libya and sent his operatives to create ties with additional Islamist groups in the country (security.blogs.cnn.com, May 15, 2012). In 2012, he was involved in the attack against the US Embassy in Libya and was designated by the State Department as a global terrorist threatening the security of the US (Dailysabah.com, December 4, 2014). After the US authorities captured a senior Al-Qaeda operative in Derna, Abd al-Baset Azzouz left Libya and moved to Syria (www.krdo.com, November 18, 2014). 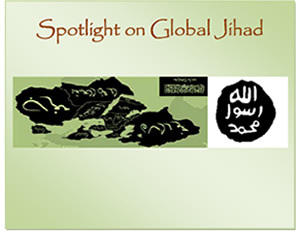 Following the ITIC’s study on ISIS, from now on a weekly publication will be issued by the name of Spotlight on Global Jihad. The publication will monitor developments at ISIS and additional global jihad organizations and will focus on developments in the Middle East. We welcome comments from readers. Dabiq is a monthly English-language magazine published by ISIS. Dabiq is a city in northern Syria where, according to Muslim tradition, a decisive battle will take place between the Muslim army and the Christian army, and the Muslims will win against the “infidels”.